Before I became an educational administrator, I spent 8 years teaching. Four of those years I had summers off without kids, and four years I had summers with kids. Before we had kids, I usually spent my summers doing some sort of house project. Summer was a time to re-tile the house, put in French doors, cut off my thumb. Yeah, I really had the summer thing down. Summers with kids were the same, except there were kids in the house. So essentially I would find time to get projects done around being a dad. So here is a guide that I have compiled both through experience and through conversations that will help you make the most of the summer. Get caught up on sleep, but do it wisely. We all know that during a school year educators get very little sleep. My first summer off, I would stay up late, wake up early to get my wife off to work, and then take a mid-morning nap for two hours. Sometimes this was followed by an afternoon nap. I got into a really bad habit of counting on those naps. During my second summer break, I made sure that I got adequate sleep at night, and then only took occasional short naps, which became a treat instead of the norm. Make to-do lists, both daily and for the summer. Whether you’re a Type A person or a Type B person (actually, I’m not sure if there are any Type B people in education), summer to-do lists are great reminders. For years I wrote a nightly to-do list for the next day. If I completed my chores, I got to spend time however I wanted it. The great thing about summers for educators is that we have flexibility to bump most of our to-do items to the next day if something comes up. But both daily and summer to-do items are helpful (although I have to admit that every summer for thirteen years I wind up with a pile of ironing that needs to be done before the school year begins, and it does not get done until the day before school starts. Every summer for thirteen years… Maybe this will get added to my to-do list for tomorrow). Avoid excessive screen time. We tell kids this all of the time, and I find that it is too easy to slip into watching movies or playing video games extensively during the summer. It’s almost like I want to make up for not having a life during the school year. However, we all know that too much screen time makes us feel terrible. So avoid the hours of screen time on end. Use screen time as a reward for checking some things off your to do list. Travel. I know that educators don’t get paid a lot, so most of us cannot spend extensive time traveling across Europe or rafting down the Nile. But there are plenty of things to see and do right around our homes. Contact your local office of tourism and see what great things your state has to offer. If you’re planning a road trip, look for great things to do along the way. We’re driving from Phoenix to Chicago with the kids this summer, and we’re looking at some great stops along the way, including a musical road in New Mexico and the Cadillac Ranch in Texas. Learn something new. With the extra time in the summer, it’s the perfect opportunity to learn a new hobby. Practice that instrument that you always wanted to learn. Take some dance lessons. Golf (ask for educator discounts. Shalimar Golf Course in Tempe, Arizona, offers free golf for teachers June through August, while others offer percentage discounts). Get a canvas and paint something. Get a hammer and build something. For a lot of us the summer is a chance to let creativity flow, and that can often happen with new experiences and new challenges (check out one of my first posts on being a lifelong learner here). Read a variety of fiction and nonfiction. I love reading. I read a little every night before I go to bed. I often get caught up in fiction after fiction after fiction. Summer is a great time to reflect and look at new teaching practices, new ways of approaching things in the coming year. I’m not talking about discovering the New Math (I still have nightmares about Base 8 math). But read some books that will help you get along better with coworkers, communicate more efficiently with parents, or supply you with new ways to reach your students. Everything in moderation. My best breaks, whether they are a three day weekend or a two week vacation, are the ones where I can walk away and say, “This was the perfect combination of relaxing and productive. For me, the To Do Lists help this. One summer, I listed all the big chores that I wanted to accomplish, and then wrote “$10” next to each one. I paid myself for each of those chores, saved up the money, and used it to purchase a couple of Lego Architecture sets. Who said that allowance is only for kids? 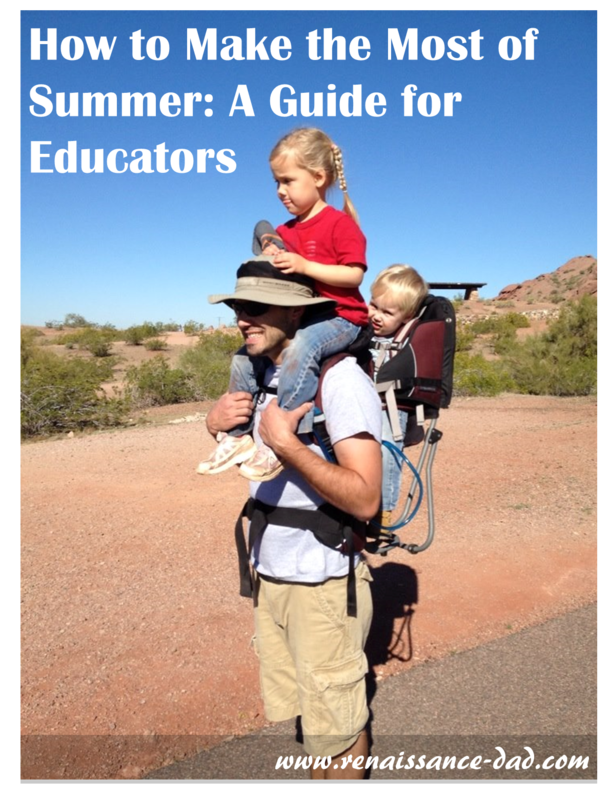 Sometimes educators need motivation to be productive during the summer, and that motivation can be something relaxing. Or therapeutic. Or cathartic. There is no cookie cutter way to make the summer perfect. My perfect summer will be different from yours, which will be different from your colleague’s, which will be different from your neighbor’s. But a variety of activities, and a balance of productivity and relaxation, and this will be the best summer ever. But I guarantee I will be ironing my pants the night before the first day of school.